With so many options out there, choosing the perfect windows for your home can be a daunting task. If your criteria for the ideal window includes plenty of ventilation and great visibility, then casement windows may be the best choice for your Raleigh-Durham residence. 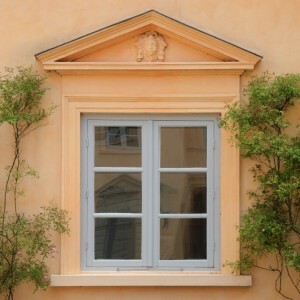 Hinged at one side and opened outward with a crank, casement windows are unique in that they are able to be completely opened. Unlike double-hung windows that only open halfway, casement windows offer the most air-flow and let in the most light of any of our replacement window options. Upon closing, an airtight seal is made between the casement window sash and frame, preventing leakage and drafts, and making them an extremely energy-efficient option for your Raleigh-Durham home. With many style options, the installation of casement windows over your kitchen sink or in your bathroom can a beautiful touch, offering an open, airy feel to any interior space. Gerald Jones Company offers installation of casement windows with a variety of grille patterns, exterior finishes, materials, and hardware options. Talk with a Raleigh- Durham casement window installation expert from Gerald Jones today to find out more! If you’re considering casement windows for your home, contact Gerald Jones Company in Durham. We are dedicated to providing customers with the best window installation services since 1955, and our knowledgeable staff will work with you to find the ideal casement windows for your home! The home improvement experts at Gerald Jones Company proudly serve homeowners in Cary, Apex, Morrisville, Chapel Hill, Butner, Raleigh, North Raleigh, Durham, Hillsborough, Carrboro, Mebane, Roxboro, Creedmoor and surrounding areas of NC.